What Must Be Printed on the Ballot? I've always said that I don't know everything. Sometimes one forms a belief on a casual reading of written material. Sometimes one doesn't go back to re-evaluate that belief as new information comes in. It's somewhat like when you read a book. A second or third reading often reveals new insight that you totally missed the first time you read it. So, what is required by law to be printed on the ballot for a Proposition 39 bond measure? There are three places to look. No part of Proposition 39 references the ballot. That leaves the ballot statement presentation to the discretion of the legislature. Elections Code 13119 is the general elections law for taxation measures. It's most recent revision became effective January 1, 2018. Education Code 15122 also predates Proposition 39 and deals with any school or college district bond measure. Education Code 15272 was part of the companion act to Proposition 39 that became effective when Proposition 39 passed. The words to appear upon the ballots shall be "Bonds-Yes" and "Bonds-No," or words of similar import. A brief statement of the proposition, setting forth the amount of the bonds to be voted upon, the maximum rate of interest, and the purposes for which the proceeds of the sale of the bonds are to be used, shall be printed upon the ballot. No defect in the statement other than in the statement of the amount of the bonds to be authorized shall invalidate the bonds election. In addition to the ballot requirements of Section 15122 and the ballot provisions of this code applicable to governing board member elections, for bond measures pursuant to this chapter, the ballot shall also be printed with a statement that the board will appoint a citizens' oversight committee and conduct annual independent audits to assure that funds are spent only on school and classroom improvements and for no other purposes. Why are these requirements needed? Because the school bonds cartel has a long and sordid history of hiding important information from the voters. Without these requirements in place, the ballot statements that voters mark "Yes" or "No" would be the slickest marketing material that Madison Avenue could produce. Believe me when I say that districts spend thousands of dollars of your taxes to identify the best arguments that will trick voters into a "Yes" vote. To the cartel, the ends justify the means. Lying and cheating are rationalized. After all, it's for the kids. Here! I'll prove it to you in one universal example. Education Code 15122 requires that the districts print the "maximum rate of interest" in the ballot statement. You and I, being honest people, would read that and understand it to mean what it plainly means -- let the voters know the top rate of interest at which the bonds could be issued. For many years, the top legal rate has been 12%. You're smart. Paying as much as 12% interest on money borrowed for decades would be foolish, perhaps even criminal. So what does the cartel do? Between 2001 and 2016 districts placed 1,243 bond measures on the ballot in California. All of those measures were subject to Education Code 15122. Of those 1,243, a total of 4 (that's not a typo) told the voters the maximum rate of interest as a number, 3 stated 12%, and 1 stated 8%. All the other 1,239 measures didn't tell the voters anything meaningful -- 1,194 measures used a slimy, lawyer tactic and told the voters, in effect, go pound sand (in 78 different ways); 45 didn't mention interest rates at all. If a lawyer did that to you for a home mortgage or consumer finance agreement, he'd be in jail. See the top 10 favorite lies, below. By the way, the measures that disclosed the maximum interest rate were more than 10 years ago. Three of the four didn't pass. Three of the four were in Inyo County -- the last, but now extinct, honest county in California. Like many things that happen, I did not go looking for this new insight. I was actually working on an analysis of good old Jerry Brown's opinion on refunding bonds when he was attorney general. One of the cases he cited repeatedly was a case that I was already very familiar with involving Hermosa Beach City Elementary School District. I wanted to see how Brown was using that case, which had nothing to do with refunding bonds, in an opinion about refunding bonds. It was this section of the opinion, that made me review my previous understanding. Even more importantly, legislation enacted in connection with the passage of Proposition 39 - remarkably cited by neither party - confirms that the list of specific school facilities to be funded need not appear on the ballot. Education Code section 15272 became operative when the voters approved Proposition 39. (Stats.2000, ch. 44, � 6 (Assem. Bill No.1908).) 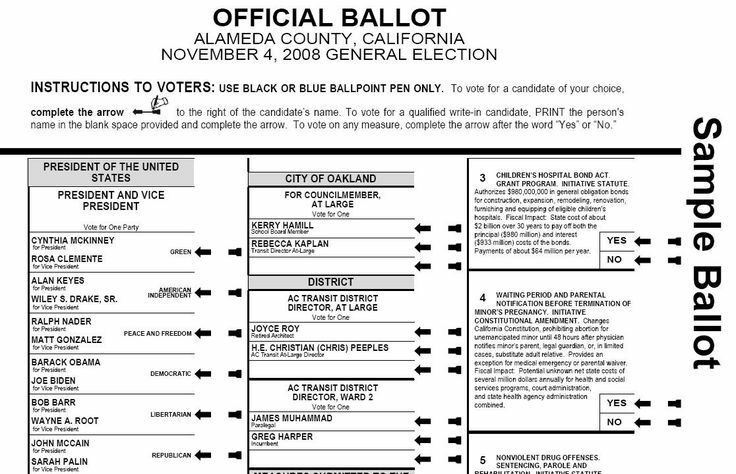 Entitled "Additional ballot requirement," it provides: "In addition to the ballot requirements of Section 15122 and the ballot provisions of this code applicable to governing board member elections, for bond measures pursuant to this chapter, the ballot shall also be printed with a statement that the board will appoint a citizens' oversight committee and conduct annual independent audits to assure that funds are spent only on school and classroom improvements and for no other purposes." (Ed.Code, � 15272.) In pertinent part, Education Code section 15122 requires that "[a] brief statement of the proposition, setting forth the amount of the bonds to be voted upon, the maximum rate of interest, and the purposes for which the proceeds of the sale of the bonds are to be used, shall be printed upon the ballot." (Ed.Code, � 15122; see also Ed.Code, � 15346 [same requirements for a ballot proposition].) None of these provisions states that either the list of specific school facilities projects or the school district's certification of the [48 Cal.Rptr.3d 712] factors it evaluated in developing that list must appear on the ballot. The ballot is the piece of paper that the voters mark with their vote choice. Here the judge was describing two of three statutes that impose requirements on the ballot presentation. To improve school facilities, upgrade fire alarms and student safety and security, replace old windows, and repair restrooms and other facilities, shall Lone Pine Unified School District issue $6 million in bonds at legal interest rates, projected tax rates of 6¢ per $100 of taxable value while bonds are outstanding (averaging approximately $400,000 annually), and requiring responsible repayment costs, citizens' oversight and audits to ensure funds are ONLY spent for Lo-Inyo Elementary School and Lone Pine High School, and NOT for any other purpose? So taking all three of these statutes into account, let's build the framework into which a district must shoehorn its ballot statement. From Elections Code 13119(a), we start with this. Shall the measure ... be adopted? Now add the requirements of Education Code 15122. Shall the measure authorizing [district] to issue [dollars] of bonds at not greater than 12% interest rate for [purposes] be adopted? Now add the requirements of Education Code 15272. Shall the measure authorizing [district] to issue [dollars] of bonds at not greater than 12% interest rate for [purposes] with board-appointed citizens' oversight committee, annual independent audits to assure that funds are spent only on school and classroom improvements and for no other purposes be adopted? Now add the requirements of Elections Code 13119(b). Shall the measure authorizing [district] to issue [dollars] of bonds at not greater than 12% interest rate, levying approximately [dollars] in taxes annually at estimated [tax_rate] per $100 of assessed value for [number] years for [purposes] with board-appointed citizens' oversight committee, annual independent audits to assure that funds are spent only on school and classroom improvements and for no other purposes be adopted? What I consider the most important part of Elections Code 13119, subsection (c), doesn't mandate any words, but it heavily restricts the nature of other words used. Shall the measure authorizing [Lone_Pine_Unified_School_District] to issue [$6_000_000] of bonds at not greater than 12% interest rate, levying approximately [$400_000] in taxes annually at estimated [6¢] per $100 of assessed value for  years to [improve school facilities, upgrade fire alarms and student safety and security, replace old windows, and repair restrooms and other facilities at Lo-Inyo_Elementary_School and Lone_Pine_High_School] with board-appointed citizens' oversight committee, annual independent audits to assure that funds are spent only on school and classroom improvements and for no other purposes be adopted? Text connected with underscores represent a single word according to the word-count rules. So, as you can see, the ballot statement now exceeds the 75-word limit by 11 words, so it's time to cut some of the synopsis. Shall the measure authorizing [Lone_Pine_Unified_School_District] to issue [$6_000_000] of bonds at not greater than 12% interest rate, levying approximately [$400_000] in taxes annually at estimated [6¢] per $100 of assessed value for  years to [improve school facilities, upgrade safety and security equipment, replace windows, and repair restrooms at Lo-Inyo_Elementary_School and Lone_Pine_High_School] with board-appointed citizens' oversight committee, annual independent audits to assure that funds are spent only on school and classroom improvements and for no other purposes be adopted? I took out the word 'old' because it's argumentative and prohibited by Elections Code 13119(c) and further summarized the purposes, but we're still over the limit. Shall the measure authorizing [Lone_Pine_Unified_School_District] to issue [$6_000_000] of bonds at not greater than 12% interest rate, levying approximately [$400_000] in taxes annually at estimated [6¢] per $100 of assessed value for  years to [improve school facilities, upgrade safety and security equipment, replace windows, and repair restrooms] with board-appointed citizens' oversight committee, annual independent audits to assure that funds are spent only on school and classroom improvements and for no other purposes be adopted? There! We have a "true and impartial synopsis" that's "neither argumentative nor likely to create prejudice." Or we could make the ballot statement more generic and point the voters to the actual measure that contains, in an ideal world, "a list of the specific school facilities projects to be funded." Shall the measure authorizing [Lone_Pine_Unified_School_District] to issue [$6_000_000] of bonds at not greater than 12% interest rate, levying approximately [$400_000] in taxes annually at estimated [6¢] per $100 of assessed value for  years to [fund the list of the specific school facilities projects in the full-text measure] with board-appointed citizens' oversight committee, annual independent audits to assure that funds are spent only on school and classroom improvements and for no other purposes be adopted? I hadn't paid close enough attention to the language of Education Code 15272. After Elections Code 13119(c) was enacted, I took the three gimme's at the end of almost every ballot statement written by school bonds cartel lawyers to be inserted as the result of the ubiquitous voter survey that the district conducts. I perceived the language "citizens' oversight, annual audits, and no money for administrator salaries" as survey-tested selling points that were not impartial. At least two of those things are required by law, so they would be applicable whether or not they were mentioned in either the ballot statement of the full text of the measure. Now I understand that they are a statutory requirement. Therefore, their absence, rather than their presence would violate the law. Significant alterations, such as argumentative modifiers like "strict" would also violate the 15272 requirement. Perfect! The statutory requirements on the ballot statement have virtually blocked out the ability of the school bonds cartel to deceive voters about the nature of the measure. There's no room for the lies. That's why the cartel hates it. So why are the county registrars not enforcing the law about ballots? They're criminals, just like anyone with governmental power. Is there any county registrar who will give a written explanation of why he or she is above the law? Don't hold your breath!